Ten elementary school children were transported to the hospital after a recent school bus accident on Thomas Landers Road, just a block away from their school. According to CBS Boston, the accident happened at roughly 9:00 a.m. when a box truck drive into the lane of the school bus. The driver of the bus had to swerve to avoid a collision, but ended up leaving the road and slamming into a utility pole. The electrical wires wound up lying all over the road. Luckily, the bus driver was able to keep all of the kids on the bus until emergency response arrived on scene. Our Boston bus accident lawyers understand that approximately 400,000 Massachusetts students are transported by school buses annually, according to Massachusetts Health and Human Services. By law, kids on bikes must wear helmets, and in cars kids must be secured in an approved safety restraint at all times. So it may be a surprise to learn that federal law does not require seat belts on most school buses. For close to 25 million students across the globe, the school day begins and ends with a trip on a school bus. The greatest risk is not riding the bus, but approaching or leaving the bus. Before children go back to school or start school for the first time, it is essential that adults and children know traffic safety rules. -Make sure you’re at the bus stop at least 5 minutes before the bus’ scheduled pickup time. -Stay at least 6 feet from the side of the road as the school bus pulls up. -Wait until the bus stops, the door opens, and the driver says that it’s okay before stepping onto the bus. -If you have to cross the street and there is a bus around, make sure you never do so behind it. You want to cross in front and do so at least 10 feet in front of it. You want to make sure that you can always see the bus driver and that the driver can see you. -Make sure to never walk behind the bus. -When you board the bus, go directly to your seat and sit down. Do not linger in the aisle. -Keep the bus aisle clear. The driver needs to be able to see straight through to the back without and obstruction. -Remain seated at all times. -Keep quiet so the driver can hear their surroundings and better keep you safe. -If you drop something near the bus, make sure that you tell the bus driver before getting it. You never want to try to pick it up because the driver may not be able to see you. 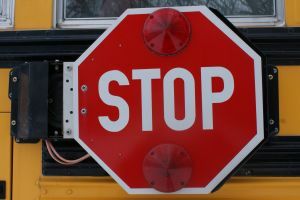 -Parents should children to follow these common sense practices to make school bus transportation safer. On average, roughly 20 school-age occupants of school transportation vehicles (and pedestrians) are killed in transportation-related traffic accidents each and every year, according to the National Highway Traffic Safety Administration (NHTSA). If you or someone you love has been injured in a traffic accident in the Boston area, contact Jeffrey S. Glassman for a free and confidential appointment to discuss your rights. Call 888-367-2900.